ConVino Wine Bar : Northampton MA. Because everything is better with wine. Welcome to ConVino, a spot for delicious wines and foods in a setting that is stylish without attitude, comfortable but not frumpy, grown up but not stodgy. Located in the basement of Thornes, we serve Mediterranean inspired fare and have a vast variety of wine by the glass (over 70 last time we counted). Come on in—sip, snack, and enjoy. Because everything is better with wine. For the Pairing Special this weekend we have Chili Lime roasted Salmon Filet with fried polenta, stuffed poblano and jalapeño cilantro crema. We've paired it with the Ascheri Arneis. All the green flavors in the food bring out all the fruit in the wine, and the acid in the wine cuts the fat of the salmon. It's delicious! 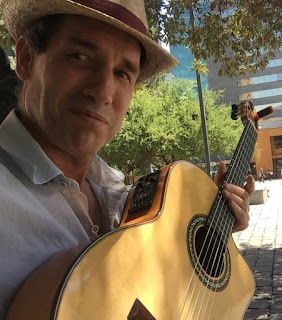 Tony Silva and his Spanish Guitar play songs from Spain, Mexico, and South America every Sunday evening from 6pm - 8pm. We seem to have made it through Winter, finally. Doesn't look like it will dip below freezing again. I'm about to move the palm tree back out to the patio and get the patio furniture out of storage. I don't plan to start setting up the patio for a little while. We open at 5pm most days, and by that hour, it is really a bit too chilly to be sitting outside. I know we have a heater and blankets, but I'm tellin' ya, don't expect it til May. Passover and Easter are in a couple of weeks. We wish you all joyous holidays. 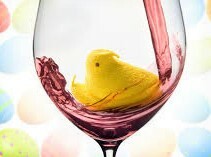 We will, as usual, be closed on Easter Sunday. It's one of the 5 days a year that Thornes is closed, so we get to be closed. 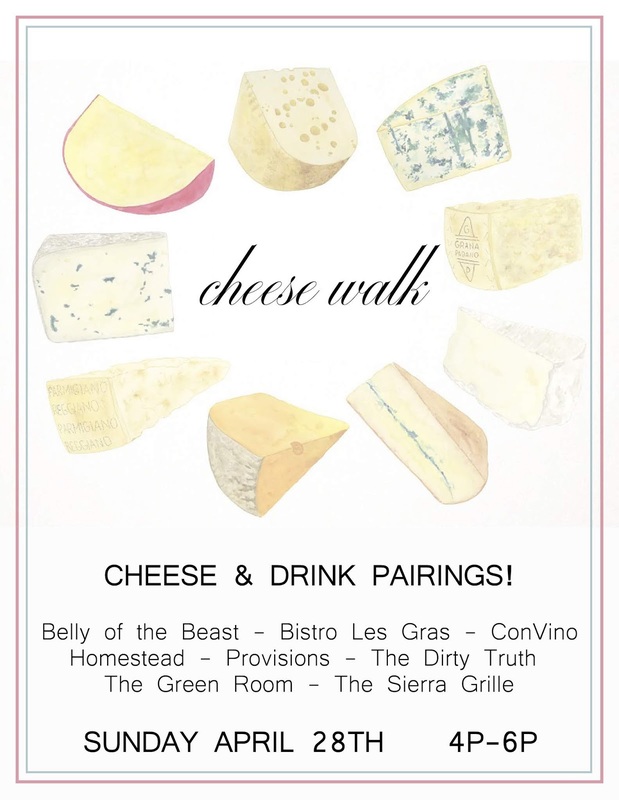 On April 28th, a bunch of restaurants in town are collaborating on a Cheese Walk. We'll have a cheese or two paired with half glasses of wine. 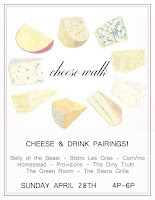 I am trying to source some cheeses that are hard to get in Western Mass for this event, so I'm not sure just yet what we'll have. They'll be tasty, though, for sure. And I know Franchesca is looking forward to finding the perfect pairings. 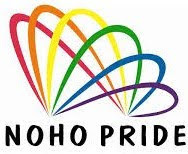 The Northampton Pride Parade is May the Fourth. (I don't know if the parade organizers realized that it's also a Star Wars holiday.) 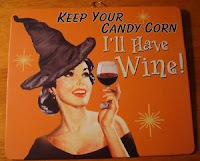 You know I always say everything is better with (con) wine (vino), and it's especially true about parades, I find. If the weather's nice, the patio will be open. A perfect place to proudly unwind from the festivities. Take Mom out to ConVino for Mother's Day. We will open 2 hours early at 1:00 and have our full menu plus some Brunchy items. Say "I love you, Mom!" with a couple of Mimosas and Brioche French Toast. Or a dozen oysters and a bottle of Muscadet on the patio. Graduation season starts actually the Friday before Mother's Day, with UMass graduation. The weekend after is Smith, Mt. Holyoke and Hampshire, and Memorial Day Weekend is Amherst. Reservations are highly recommended on those weekends. We look forward to seeing you often as the school year winds down and through the Summer. Groundhog Day! 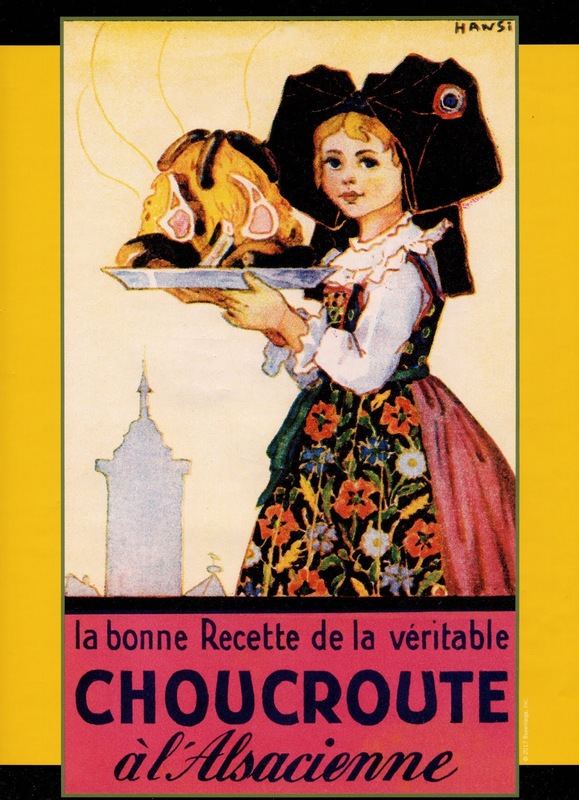 Come have choucroute. Again. Valentine's Day! 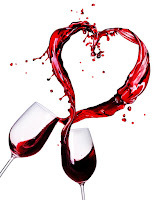 We'll have our full menu and some romantic specials. We still have some tables, but make your reservations because we're filling up fast. There's other stuff. I'll get to it soon! Well, this weekend there is a lot. I was recently informed that the last Saturday of every month is "Open that Bottle Day." We open bottles every day around here, but there is One that needs to be opened. 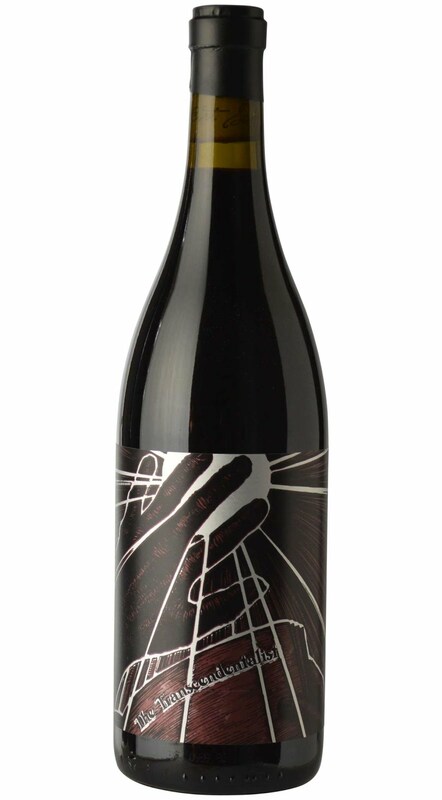 In 2015, we bought a few magnums of a gorgeous California Syrah, Grenache, Mourvedre called The Trancendentalist. We sold one very quickly, it took over a year to sell another, and we have had just the one left for a very long time. What we've learned is that our customers really like to try a bunch of different glasses of wine, and they rarely want a bottle with 10 glasses of the same wine. It was a good learning. And now, we're going to pull the cork on the last bottle of the Trancendentalist and sell it by the glass. We took a Coravin taste of it, just to be sure that it wasn't corked. It is maybe even better for having almost 4 extra years in the bottle. To add to the experience, we're going to serve it with a plate of Pesto di Noci toasts. It's a lovely sip and snack for $14.50, while it lasts. Saturday night, we're going to take a jump to the left, and then a step to the right. 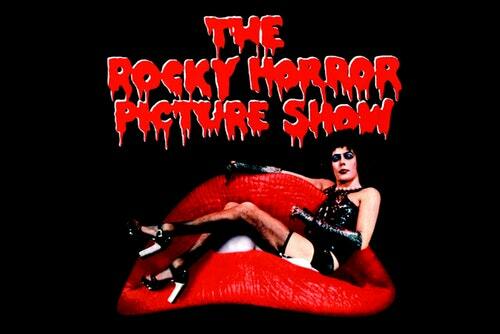 We're going to put the Rocky Horror Picture Show on the screens at 10:15. I suggest drinking an actual toast, rather than throwing toast at the screen. I mean, we do have wine, and we're not underage in a movie theater. 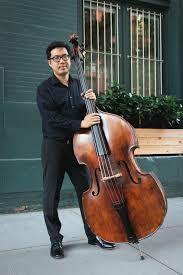 Sunday, we have the rescheduled Fumi Tomita duo from 6pm - 8pm. They were supposed to play last Sunday, but we had that "weather event". So glad to have decent weather on tap for this Sunday. It should be a great evening of jazz. 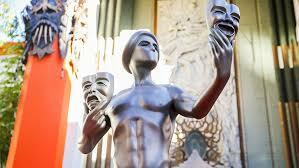 Then we'll have the SAG awards on the screen in the bar until closing time. There's more when February gets here, and I'll post more soon. Spoiler Alert: We will not have the Super Bowl on the screens here. 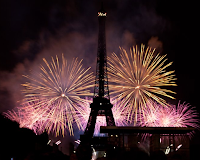 Join us for our Midnight in Paris party New Year's Eve. We'll be open at 4pm which is earlier than our usual Monday time. The Northampton fireworks are at 6:15, set off from the roof of the parking garage. So have an early snack and see the fireworks, or come later for dinner. 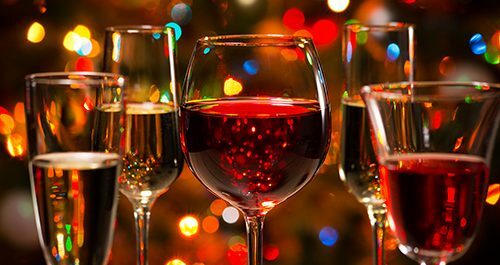 We'll be Closed for New Year's Day, and we'll also be closed on January 2nd, so our staff can have a holiday party. We are starting our 5th year today. Thank you so much for your support over the years. We look forward to seeing you in 2019! Well, we've had our first big snowfall, so I guess we'll just jump into the holidays full speed. Tomorrow, Nov 17th, is Bag Day - a huge shopping extravaganza in Northampton. ConVino is the perfect spot to take a break, have some wine, check your list, strategize your best route to the next retail success, fortify with some fancy fries and sally forth. Thanksgiving is next week. We will be open regular hours on Wednesday and Friday, though we'll be closed on Thursday. If you are planning to meet up with a bunch of friends and you would like to be in our Lounge area, you should call and reserve it. We seem to have more 5-8 people groups the night before Thanksgiving, so just a heads up. December 1st is Northampton's Holiday Stroll from 5pm-8pm. They'll close Main Street and have various family oriented festivities. We're a cozy and relatively calm spot to break from the outdoor activities. We will be Closed to the general public on Monday, December 10th. We've been rented out for a Holiday Party! We only do one buy-out per holiday season, so if it sounds like something you might like to do, call early for next year. Groups of up to 20 may still be able to be accommodated this year. If you would like to have your Holiday Party at ConVino give us a call, and we will see if we can do it. We will be Closed on Christmas, New Year's Day, and also January 2nd (for our annual Staff Party). Christmas Eve we will be open from 1-5pm with a limited menu. Don't forget that ConVino gift certificates make a great holiday present. 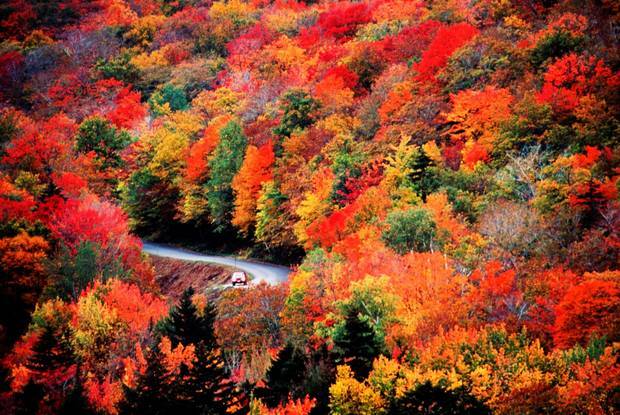 Well, Happy Autumn in New England, everyone. We are starting to have cooler days and crisp nights, and a few leaves are starting to turn. 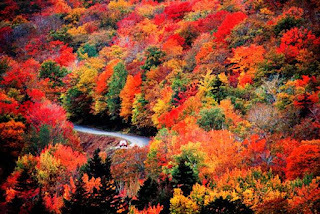 Soon we will be in full Leaf Season. We're changing a few things on the menu. The Corn Risotto with Goat Cheese and Basil that we had for September was delicious and used massive amounts of corn cobs to make the stock. As the corn and basil season is winding down, we're changing the risotto to Ratatouille Risotto. All arborio. No corn. With goat cheese, and with our ratatouille over the top. We do have a fair amount of corn kernels cut from the afore mentioned cobs. So we added a new flatbread with caramelized onions, corn, goat cheese and basil. It goes beautifully with the Thurnhof Muscat from Alto Adige, by the way. The Pesto di Noci toasts are back for fall, as are the Roasted Beet Salad and the Filet Mignon. Lots of fun stuff is happening on the weekends in October. This weekend, the Paradise City Arts Festival is at the Fairgrounds. Gorgeous stuff to wander around and look at. The show closes at 6 each day, just in time for a delicious dinner at ConVino? Arts Night Out is next Friday and has a jazzy theme as a lead in to the upcoming jazz festival. The Northampton Jazz Festival is October 19-21. We will have Sarah Clay singing her vintage vocals with Draa Hobbs on guitar and Steven Bulmer on bass from 7-9 on the 19th for the Jazz Strut. You will want to make reservations for this, as we will fill up. And Halloween is a-comin'. I never know who on my staff is going to wear a costume to work, but somebody always amazes me with their costume cleverness. We'll give one free Fancy Fries per table if at least one person at the table is in costume. Since we last posted, we won the Gazette Reader's Choice poll for Best Wine List. This is the 3rd year in a row that we've won. Thank you to all y'all for voting for us! RetroFaire is Sept 8th and right outside our door. We will be open our normal schedule. I know we've opened early for this in the past, but we weren't actually well patronizedduring the extra hours, so we are not doing that this year. We will have the oyster special that we've done for this in the past, with the price break on a half dozen oysters as well as the full dozen. And the rest of the full menu. Inside and outside. Arts Night Out is September14th. It's usually a busy night for us, so you might want to make reservations. Redbeard the Pirate. Barbarossa. We've all heard him mentioned in stories and movies. He was born in Lesbos, which is now part of Greece but was part of the Ottoman Empire back then. That happens to be where my family is from, and may explain why I am so into Talk Like A Pirate Day. It's September 19th, and if ye talk like a pirate we'll give you 5% off!